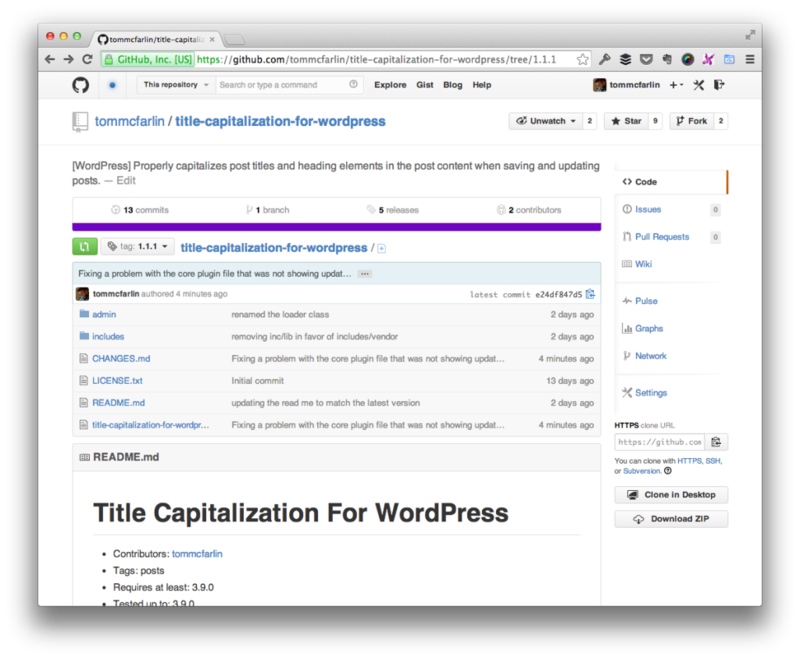 A couple of weeks ago, I released the first version of Title Capitalization for WordPress. After the first version was released, I received some feedback both in the form of code reviews, issues, and some other minor updates. In case you missed it, I released 1.1.2 to GitHub on May 4th (because you should always ship something on Star Wars day :). This particular update includes a number of small fixes including one that was occurring with the GitHub updater failing to show updates for the plugin. Modifying the call back for the post capitalization so that shortcodes are not processed. Renamed ChangeLog to CHANGES file for GitHub Updater. Obviously, there’s just a lot of small things here and there that have been resolved, but if you were previously having issues with the plugin working in conjunction with plugins, then you should be fine. Over the next few iterations, there are some changes I’d like to introduce such that all heading tags are matched regardless of if they have attributes or not (as of now, it only matches those with no attributes). Additionally, I want to update the core TitleCase class so that it can be extended such that we can easily introduce new rules for capitalization based on different rules. At any rate, this is by far the most stable version of the plugin that’s been released thus far – so if you’re a regular blogger and want to make sure that your titles and heading elements are properly capitalized, then check it out. Next PostNext Marked as Read Because of Lack of Time?